Now with the excitement of the 15 WKC behind us, I have returned to the routine of keiko in my regular dojo. Unfortunately until Sueno sensei arrives in two weeks time, I am back on the motodachi side. As the saying goes “it is better to give than to receive”. I very much enjoy practising with senior kendoka, be they more experience nanadan, or better still, hachidan sensei. Having spent much of my kendo life on the junior side of the dojo, I am comfortable with my obligation as kakarite. In short, I know that I need to constantly attack any target that I see, be it hard fought for or gratuitously given to me. The old kendo adage “see it, hit it” is crucial to being a good student. If you see sensei’s men you should strike with 100% of your energy in the feeling of sutemi (throwing away the seeds). If he takes away your opportunity and returns your strike with kaeshi dou it doesn’t matter. The point is that you saw the chance and made a concerted, sincere attack. Most kendoka understand this, but there are a few, who regardless of opponent treat every keiko like a shiai, where not losing points is more important than making them. This attitude encourages blocking the opponents technique with the shinai without the intention to counter. More bizarrely, I see people who drop their elbows to their sides to avoid having their dou hit. Perhaps the worst habit engendered by this approach is that of always holding back. By this I mean starting an attack but being prepared to stop it mid flow if the receiver tries a counter technique. 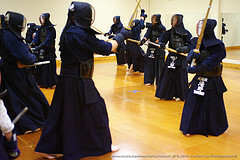 I believe that training in this way does not allow anyone’s kendo to develop. Unless we are able to attack wholeheartedly when we see an opportunity, we will never achieve the “holy grail” of mushin. As for motodachi, he or she is there to help you. In hikitate-geiko, which is by and large the most common form of keiko between senior and junior, the objective is for motodachi to stay just slightly ahead of kakarite. 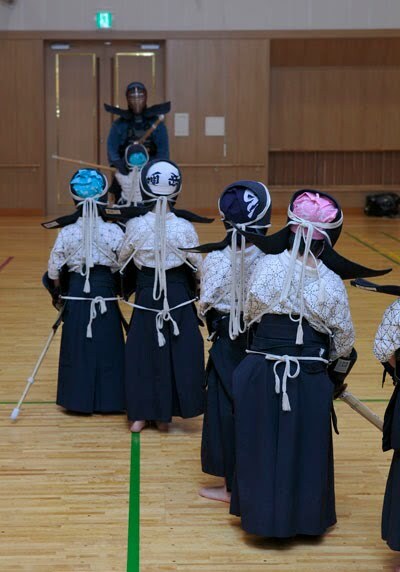 After fighting for shodachi, or first point, the teacher will normally create a number of subtle opportunities for his opponent to attack. This can be particularly useful if these openings stimulate techniques that kakarite do not normally use. For instance if he or she tends to rely on counter techniques, then stepping back as you create an opening will encourage the use of hikibana waza and a more forward going approach. Of course motodachi deserves some fun from the process, so a positive, fearless kakarite who is not constantly worrying about being countered, allows him or her the chance to crack in the odd kaeshi dou or suriage men. Above all, both partners should remember that the purpose of keiko is for all of us to grow and develop. Making the most of motodachi! Motodachi’s job is to enable kakarite to practice technique correctly in the best timing and distance for his or her level. Whether receiving kirikaeshi, uchikomigeiko, kakarigeiko or waza geiko, motodachi should dictate the opportunity, making clear sharp openings for kakarite to attack. It is impossible to do this without maintaining strong mind contact and building up pressure between you and the attacker. Only when you are in tune with each other should you give openings for your opponent to strike. These should be obvious and consistent but subtle. Move the shinai point to the right to receive men and to the left for kote. Raise the shinai slightly for dou. Timing is crucial. Do not stand around showing a target when kakarite is out of distance. Meet his shinai pressure with stronger pressure and open quickly as he reaches distance or makes seme. If you are acting as motodachi for a partner trying oji-waza, you should attack with total commitment. A lazy motodachi is no fun to practice with. Unless you give it 100 per cent, kakarite soon loses momentum. One of the biggest challenges for motodachi is knowing how hard to stretch his opponent in kakarigeiko. In this situation the receiver can throw in countless variables, escalating the practice from acting as a target, to employing oji-waza and ai-uchi, making tai-atari, through to breaking technique and posture by knocking down the shinai at the point of attack. All of these are valid and useful when used appropriately. The key is that you should aim to encourage and not destroy kakarite’s kendo. This may sound contradictory, but treatment that would confuse and deflate a less experience player will normally make a strong kendoka stronger and more determined. My own method is to step up the pressure against experienced younger, fitter partners, generally giving the hardest time to national team members. In all cases the exercise should be short and dynamic. When kakarite starts breathing hard, it is time to stop. Kakarigeiko should always finish on a high with kakarite making a final, successful ippon. So what’s in it for motodachi? I often hear senior people complain that they can’t improve because they are perpetually on the high side. I have asked higher ranked teachers about this in the past and with their advice come up with my own formula to get my own benefit from receiving. As well as the obvious opportunities to occasionally try my own oji-waza, I try to conduct each exercise with full spirit. I constantly think about seme, so that the moment I release pressure to allow an opening could equally be a chance for my own shikake-waza. When I allow an attack to succeed, I mentally make a counter attack. I also try to work on my own distance and zanshin by keeping in good contact distance throughout the session. Perhaps it is not as personally gratifying as three minutes with hanshi, but it certainly beats hanging around like a sandbag.